Yes Kelly's card is awesome!! Wonderful pick! Thanks for picking me as a fab 5! Happy Valentine's Day everyone! How cute is this card?!!!!! I love the bright colours and the simplicity of it. Oh my goodness!! Thank you SO much 2s4y! I am so beyond honored and totally flipping out. Thank you so much for the kind words and congrats to the fab 5! AMAZING cards! Thank you so much again! Gracias! Wow! Thanks for choosing me for the Fab 5 and congrats to the other winmners! Kelly, congrats on the win this week, your card...and blog...are amazing!! 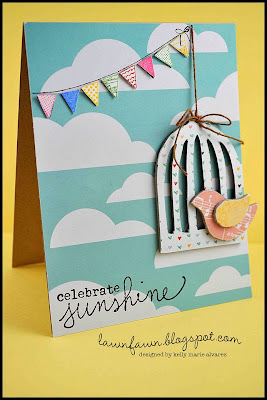 Cute super springy card! Its darling. Isnt it supposed to be based off the sketch though? It doesnt look anything like it. congrats to Kelly and the fab 5!!! Amazing work all! Very lovely card! The cards made by the other ladies are wonderful too! Congratulations! Congratulations! Fab 5 cards are really lovely and Kelly your card is fabulous!